John Peterson, John Foot, Tom Breen and Dusty Rhoads (from left) are prominent denizens of Ken's Place at Pfitzner Stadium. If you're attending a Potomac Nationals game at Pfitzner Stadium and things are going well for the hometown team, expect to hear a distinct yell emanating from the first base side of the stadium. This is the catch phrase of dedicated P-Nats fan Dusty Rhoads, an 81-year-old [though he doesn't look it] ballpark regular. Specifically, Rhoads is a "Ken's Place" regular, "Ken's Place" being a standing-room-only gathering spot identified by a banner hanging on a chain-link fence that runs down the first base line. Ken's Place has the atmosphere of a local watering hole, a largely male enclave where everybody seems to know everybody else. Within this convivial locale, the trash talk, in-jokes and beer flow freely. 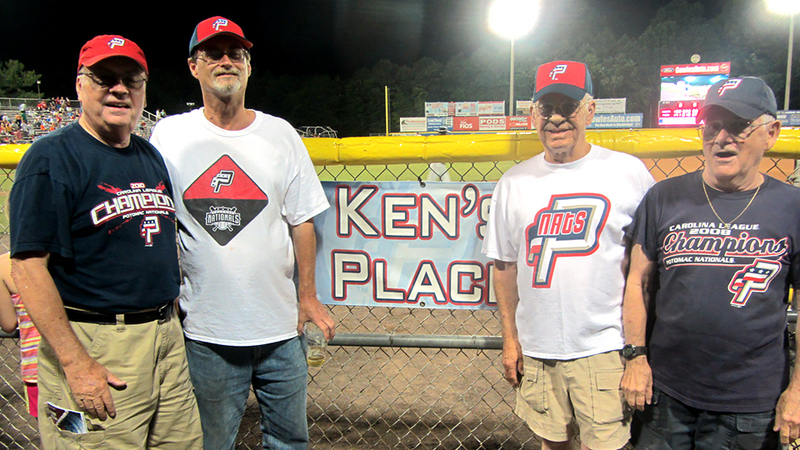 Ken's Place is a longstanding tribute to die-hard P-Nats fan Ken Rostkowski, a mainstay at "The Pfitz" who passed away suddenly in 2007 at the age of 46. "We've all been here a long time, at least 15 years," explained Ken's Place regular John Foot, whose name, he said, is spelled "just like a leg." "Kenny passed away almost 10 years ago. We had all got to be pretty good friends with him. We all met through baseball." "He was a totally different dude, man," Rhoads added. "He was a smart guy, but we liked to call him a flake," said Foot. "You'd think he was flaky, but he was cool. An Eagle scout, he'd done all that stuff," Rhoads said. "That guy was really nifty. Ken Rostkowski. He wasn't Irish, that's for sure. We would go down to this steakhouse, only about a mile down the road. They had $2 tall, $1 small [beer] in those days. Kenny, he'd done his job for the day and he'd be sitting there reading the paper. He'd say, 'Well, how come we're not at the ballpark?' OK, well, we're going to the ballpark! Just like that. It was all sequential." The first Ken's Place banner was installed during the 2007 season. Since then, Rostkowski's ballpark spirit has lived on in those who gather around it. "When [the first banner] came apart, they started putting it up again and now it's a permanent part of the place. We're all happy about that," said John Peterson, another regular. "For about 30 or 40 of us who come to the games, it means a lot." Rhoads, perhaps the most identifiable Ken's Place denizen, keeps the atmosphere loose. A Manassas, Virginia, resident by way of Lancaster, Pennsylvania, he worked for the U.S. government for his entire professional life. These days, he shares information on much more than a need-to-know basis. "I'm 81 years old. And, you know, whenever people say I'm older than dirt, well, I'm older than dirt," he said. "Coming from Pennsylvania, when I came to Manassas I said 'dried beef' and they said, 'What's that?' 'OK, pickled eggs.' 'What's that?' I had to educate them about what food is." Conversational tangents like that happen regularly when talking to Rhoads, perhaps because he's rarely watching the ballgame itself. "I'm not allowed to look at the field. If I look at the field, we're going to lose," he said. "I try to sneak a look, but then they slap me." "He figures he's seen enough baseball through the years," Foot said. Whether he saw it or not, Rhoads still yells "Hubba-Hubba" in response to a positive P-Nats development. "If you score a run, you say, 'Hubba-Hubba.' If you win the game, certainly you say, 'Hubba Hubba,'" said Rhoads. "But when I'm standing here with my back to the field and they're going [groans], I don't hear no 'Hubba-Hubba.' This is not good." So why "Hubba-Hubba?" Rhoads explained that he uses it in the spirit of the phrase's originator, Olympic medal-winning Greek pole-vaulter Pete Clentzos, who employed it as a rallying cry [rather than a pickup line]. "It's sort of a sporting exhortation," Foot said, by way of clarification. "Uh-oh, here comes the verbese," said Rhoads, using a word of his own devising. "[Foot], he's not too syncopated, so when he tries to do 'Hubba-Hubba,' he can't really get it together." And so it goes at Ken's Place, where closing time coincides with the final out. If you ever find yourself at Pfitzner Stadium, why not stop by and say hello? The regulars will [probably] be happy to see you. "Basically, these are the kind of people that we like to abide with," Rhoads said. "Any others, like politicians, we put up yellow tape, so they can't come over here. Yeah, we do."